If you want to get a good look at an organization that is truly making a difference in this world of ours please join all of us at ACS in celebrating the efforts and works of the incredible people at Fairfax CASA. It has been our honor and privilege at ACS in recent years to work with and serve this tireless team of superstars under the direction of their Executive Director, Lisa Banks. At times it can be difficult to stay on point with this treasured client on matters of marketing, website design and development, promotion and social media, when the context of their days carries so much more of what seems real importance; protecting the lives of abused and neglected children right here in our beloved Fairfax VA. Their cause will bring a tear to your eye. Their stories will put a lump in your throat. And thankfully, their efforts will put a smile on your face. In 2013 CASA volunteers spent 23,299 hours advocating for the lives of children whole lives and futures sit precariously at a point of darkness and light. Want to take a quick peek at what’s gong on here? This short video will provide the overview. Are you personally up for such a challenge? If so, visit here and learn more. Want to make a charitable contribution to support this fine work? Click here! 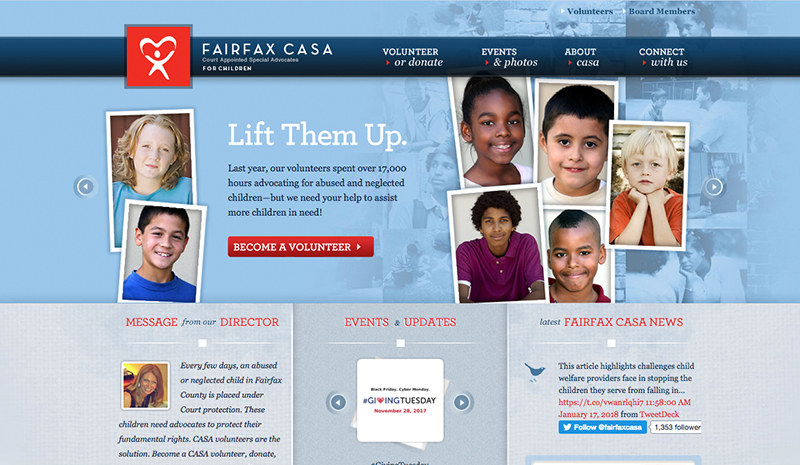 I would like to thank Lisa Banks for the continued opportunity to work with and serve the Fairfax CASA dream team. May we continue to reach for and achieve the ideals, goals and results that make such a positive difference in the lives of these precious children.